To learn more about our terrazzo restoration services, watch this short video. But, if your terrazzo doesn't look as good as the day it was installed, don't cover it or replace it — have it restored. StoneCare of Texas' qualified and experienced technicians can hone away any damage along the surface, polish it to like-new again, and apply an impregnating sealer to help inhibit stains. We can resolve virtually any problem you encounter, including stain removal, restoring or changing the finish, crack and chip repair, and sealing. Janitorial stripping and waxing often leaves terrazzo looking drab, which reflects poorly on your professional image. Our restoration methods leave your terrazzo polished to a gloss or matte finish, eliminating the need to wax and strip and reducing maintenance cost. 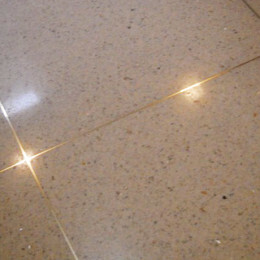 Properly sealed and maintained terrazzo retains its beautiful shine and color. Whether your terrazzo has been covered with carpet for decades, or it simply has lost its luster, the experts at StoneCare of Texas can bring your terrazzo floors back to being the beautiful, yet practical floor they were designed to be. With regular sweeping and a quick damp mop as needed, your newly restored terrazzo floors will look beautiful for years to come. Maintaining terrazzo can be easy or difficult, depending on the method. Many terrazzo surfaces are repeatedly stripped and re-waxed. If performed properly, this process can produce acceptable results. The problem is that all the waxes and coatings must be completely stripped, because anything that remains on the floor when the new coat of wax is applied turns yellow, scratches, scuffs, and collects dirt. Properly stripping a terrazzo floor is a labor-intensive, time-consuming process that requires strong chemicals and a hefty dose of patience. Depending on the amount of traffic and use, this process must be repeated as often as every few months. Imagine your terrazzo with a hard, glass-like or velvety satin/matte finish that is oh-so-easy to maintain. StoneCare of Texas can hone your terrazzo floors to remove every last bit of yellowed build-up and reveal the brand new surface that lies beneath, and polish it to your desired finish without using waxes and coatings. Your colorful little specks of marble will glisten once again, because we use the same process that is used in restoring marble and granite. Regular cleaning or janitorial services become much easier and more productive when your terrazzo floors have been properly restored using natural methods. View examples of our terrazzo projects here. We can repair and restore your terrazzo and make it look beautiful again. Contact us online or call us: SAN ANTONIO (210) 656-8019 or AUSTIN (512) 250-2613.